I’m not sure Dad thought of her as a companion. But everywhere he went, she was by his side. Except in the house, where she was not allowed. 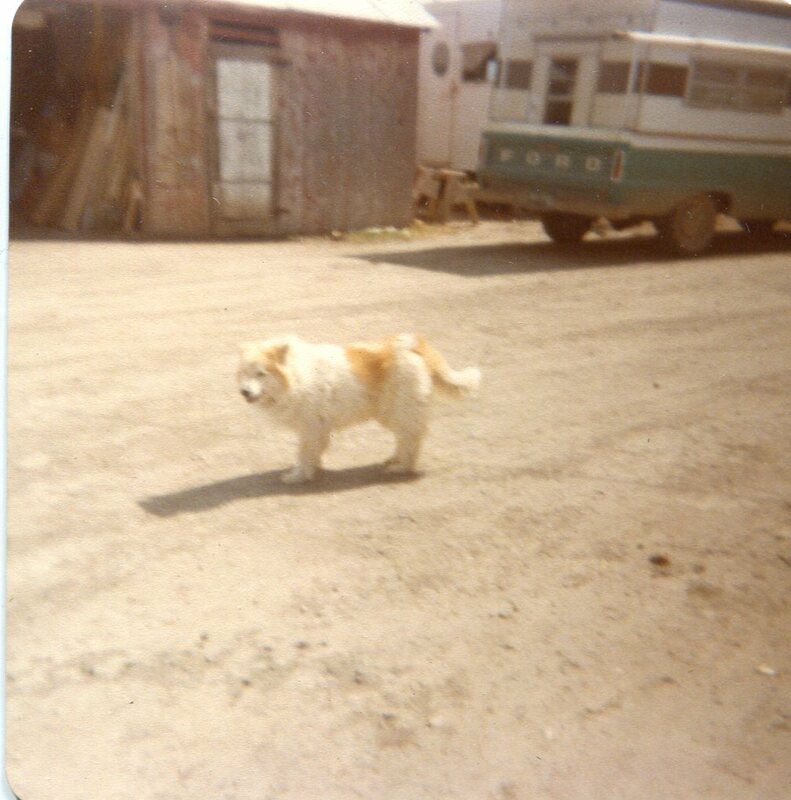 She was our farm dog, Fluff. Fluff lived to be 20-something, and took her job on the farm very seriously. She wasn’t pampered, clothed, carried in a purse, or ever even led on a leash. She ate scraps from our table, not dog food (really!). She was a working dog. Her main purpose, in both Dad’s eyes, and, I believe, in her own, was to keep watch over the farm. During the night, if he heard a certain alarm bark from her, Dad would get up, get the shotgun, and scare off a skunk in the chickens, the feral dogs chasing the sheep, or some other serious affront to our livelihood. During the day, she worked alongside Dad. Whether he irrigated, fed the livestock, bailed hay, mended fences, or attended to any other of the numerous other farm duties, she was there. She made us laugh at her antics, scooting her rear-end along the grass, chasing us when we cried wolf, or disciplining many of the other dogs, cats, goats, or other critters as she felt a need to. She was a great dog. I’m sure there were many times where Dad would have considered her a companion, as well as a worker. “Fishing Buddies” is a tribute to that companionship we feel with our animals. 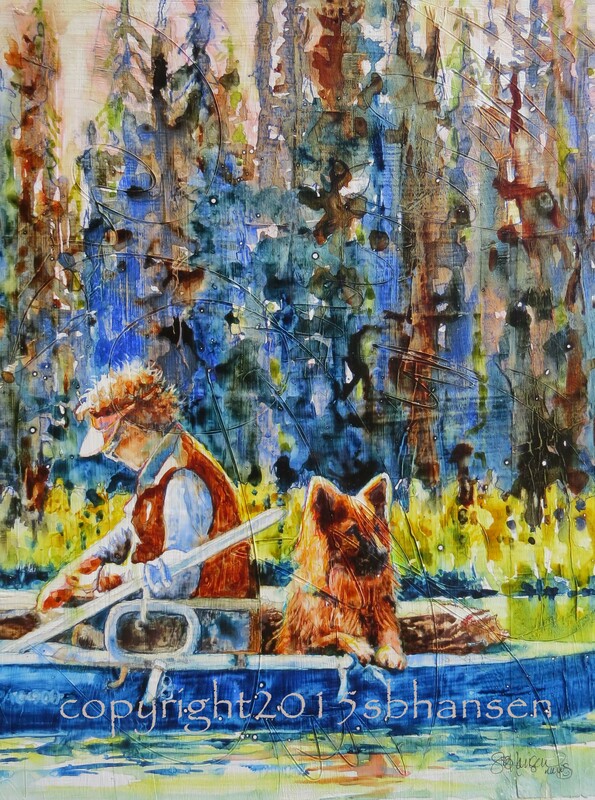 In this new painting, a fisherman, tying his fly as he floats on Hosmer Lake, pays no mind to his buddy, but clearly, this dog has a job to do. Aside from mere companionship, he actively watches the goings-on around the lake near his owner. Alerting him if something seems amiss. When planning this painting, I established the values behind the dog and owner as a mass of cool dark trees to highlight the subjects, with the dog and owner in the front and lower 1/3 of the painting. The bright yellow of the grass behind the trees give us a visual break in the overall blue theme of the painting. The boat has been cropped so that our focus is not drawn to its edge, but instead to its occupants. I worked on providing the most detail in the dog, as he is the core of the painting. He focuses his intense gaze towards us but off to the right, calling attention to him and his expression of watchfulness. The owner quietly works on his lures before casting, looking away from us so as not to call attention to himself. There is a sweep of calligraphic gesso running throughout the painting, illustrating the swing and graceful curves of a cast fly fishing line. 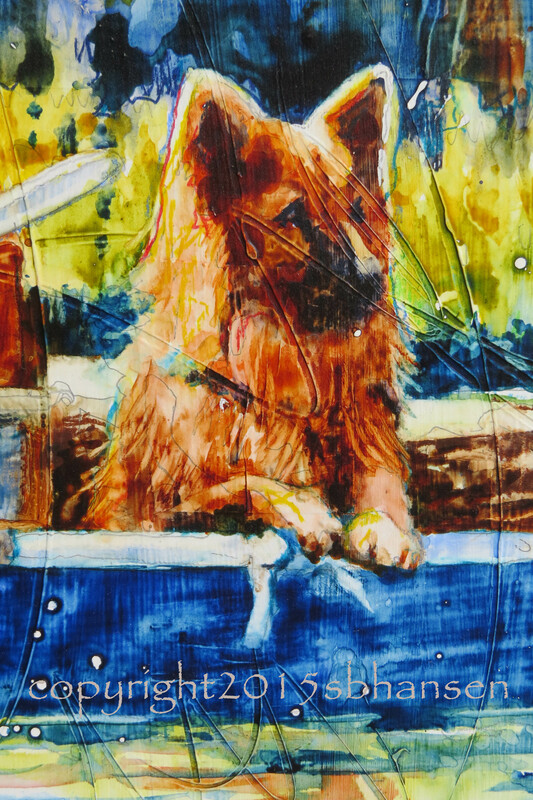 The detail, above, shows the tight work on the dog, as well as a bit of fur outlining in contrasting watercolor pencil color, just to make him “pop” more. In this detail, you can also see the sweeping fishing line in the gesso base. I wonder if this fisherman will ever see this painting. I snapped off the photos quickly and quietly, not drawing attention to myself so that he could fish in peace. It would be great if he saw this painting some day. Imagine the surprise! To purchase, send me an comment. I accept PayPal and will email a PayPal invoice. Shipping extra. Prints available, sizes starting at 8×10 for $25.